How Do They Find Their Way Back? We've noticed something interesting in your reports over the years. Many of you say things like this: "This hummer was one of 'ours' because he hovered everywhere that a feeder hung last year." Do hummingbirds really return to the same spot each spring? If you were a tiny hummer, how could you find one tiny feeder on a thousand mile journey? Read on! 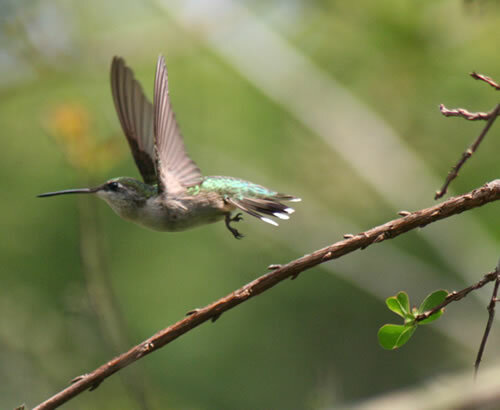 Ruby-throated hummingbirds live surprisingly long lives for such tiny creatures with a long and difficult migration. One banded rubythroat was recorded surviving at least 9 years. But most live about 3 or 4 years. Our observers were right. Most of these birds DO return to the same feeders or gardens to breed year after year. What's more, they often stop at the same spots along the way and arrive on the same date! Not bad for birds with brains no bigger than a grain of rice. Professional banders working for many years figured this out by gathering data over time. They began to notice banded birds showing up at the same sites year after year. The real puzzle is HOW these creatures of habit 1.) remember where they had a great meal 8 months earlier, and then, 2.) navigate right to that spot. What do you think? Respond to photoperiod (the number of hours of sunlight) at a certain time of year. This releases hormones that "tell" hummers its time to go. Cue into the Earth's magnetic field. Like some other birds, they may have substances in their bodies that can sense the magnetic field. By knowing which way is north, they are better able to steer. Notice and recall landmarks such as rivers, coastlines, mountain ranges, and even highways. Some scientists wonder whether birds even use their senses of smell and hearing to locate familiar places! There are always more questions in science. That's what makes it so exciting . . .
What did you learn from this about how scientists investigate questions? Imagine you are a hummer heading north to return to your schoolyard. As you get close to the town, what landmarks will you use to help you find that fantastic feeding and breeding ground? Make a drawing.